Realised in the district Sicap II Liberté in Dakar, during the residency at the art centre KërThiossane (SN). 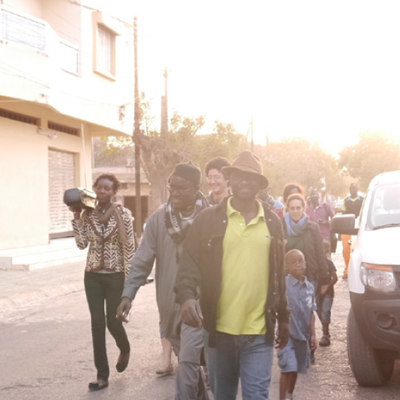 “Paris (à) Dakar” invites people to download a mp3 or connect their mobile telephones to an ephemeral radio frequency, for listening via headphones to a composition based on steps previously recorded in Paris. The sound walk has to follow one instruction: walking through the streets at the rhythm of the steps recorded in Paris soundscapes. The experience proposes a time-space dimension for re-composing and transforming the present and the everyday contexts through sound.